This project is based on the work of South Korean artist Do-Ho Suh and the lesson created by Shannah over at New City Arts. I thought her take on his work would be a great fit for the first lesson with my kinders this year. Keeping the focus on line with the first lessons of the year, this project was a good way to introduce students to contour lines and using outlines to create different shapes in a drawing. 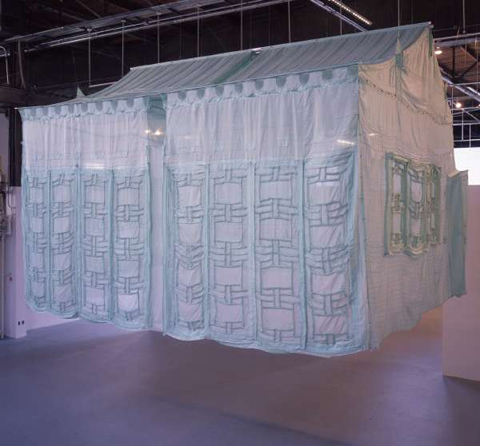 In the art21 video that I shared with the class, Do-Ho Suh talks about missing his home and wishing he were like a snail. He felt this way because a snail could pick up its home at take it anywhere. He has created numerous homes and places out of lightweight materials as a way to express this feeling visually. At this point the I prompted the kinders to share if they ever felt homesick. We then talked about things they would want to bring with them if they could be like a snail and take their belongings and home from one place to another. Video games, pets, and sweets came up quite often. Taking the lead from New City Arts, we drew out our snail bodies and added the things we would like to move with. We also added a ground line, so the snails would not float in space. All the while I emphasized how we were using contour lines/ outlines to create our drawings. After drawing, the students used markers to trace their outlines, so those lines would stand out. Once the tracing was complete students were then free to add color with crayons. Before coloring I introduced the concept of pattern in art and nature. A number of students incorporated color patterns into their snail compositions. Neat idea...reminds me of the book "the Biggest House in the World" I do a snail project each year using the book... I like the tie to contemporary art. And I'll have to check out Kristyn's book recommend. 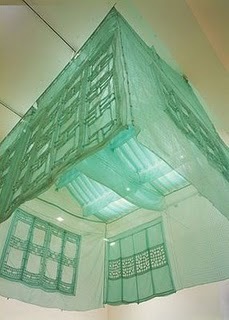 I read the story online about Do-Ho Suh a couple of months ago-AWESOME! I love the tie in you created to help the kinders feel the transient nature of a snail's home. Cool! What a great lesson! I can't wait to try this next week!